It's no surprise that people are flocking to the New Order these days. Our relevance continues to increase, in both relative and absolute terms. The honours today go to Black Pedro, who purchased 1,000 additional shares, according to his custom. 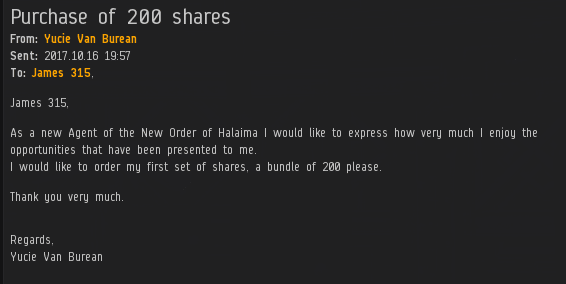 He sent us past the 1,553 billion isk mark and earned another Supreme Protector's Tip of the Hat™ to add to his already impressive collection. Quietly, cautiously, Black Pedro has positioned himself within striking distance of the all-time top 10 shareholders. This man is someone to watch. Damn! Im gonna have to start buying more shares!